We have a number of important visits to the parish coming up. 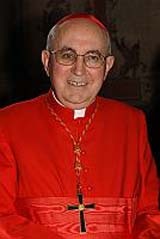 On Tuesday March the 1st Cardinal Vallini the pro vicar of Rome, 3 Bishops and 125 priests are coming for mass. They are Bishops and Parish Priests from Rome. The cardinal wants to promote Cyprus as a place of pilgrimage, hence the visit to Agia Kyriaki. From the 3rd of March the bishops of the Bishops Conference of South East Europe will be meeting in Cyprus. The Bishops attending the conference will visit Agia Kyriaki on on Friday 4th of March at approx 4pm. Patriarch Fouad is a member of the Conference so will be one of the Bishops coming here. On Tuesday 8th March the Patriarch will say mass in Agia Kyriaki at 9am. All are welcome.